Prior to an evening of musical entertainment that included Eddie Money, the final day of Chasco Fiesta 2019, April 6, included a parade of boats that began in Port Richey, traveled up the Pithlachascotee River to the Dr. Frederick A. Grassin Bridge, in downtown New Port Richey, and then back down the river. The crowd lines the shoreline at Sims Park as they wait for the boats to make the roughly 40-minute trip from the parade’s start in Port Richey. 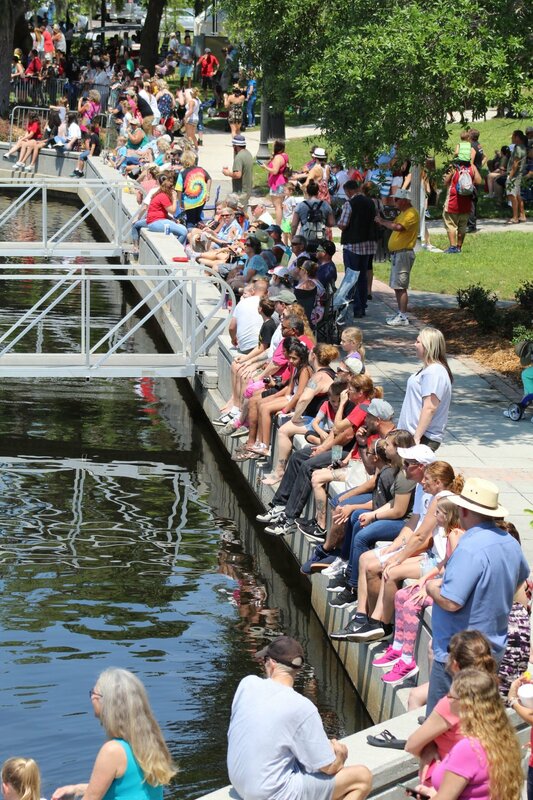 Some people took seats in the shade in Sims Park as they wait for the boats to make the roughly 40-minute trip from the parade’s start in Port Richey. The New Port Richey Police Department Marine Unit boat leads the way down the Pithlachascotee River. The royal couple of Chasco Fiesta 2019, Queen Chasco, Lisa Shippy-Gonzalez, and King Pithla, Paul Friedlander, greet the boat parade crowd. The Pasco Pace School for Girls had an entry in the Chasco Fiesta Boat Parade. The Meares Plumbing boat was firing a twin-barrel water salute to the Chasco Boat Parade crowd. So far, there have been no reports of pillaging in New Port Richey by the Viking crew from Sunset Landing Marina. A contingent made the trip up the Pithlachascotee River from the Hooters in Port Richey. The Genesis School backed efforts to protect Florida’s resurgent population of wild flamingoes. The Calusa Cruise Club thanked the U.S. Coast Guard for protecting the oceans. Gulf High School alums from the 1960s saluted the Beatles.